If you have been following my blog for a while, you probably realize that I don't have one particular style. One day I may feel a bit more urban or bohemian and on another day, I may feel more feminine. With this outfit, I was definitely feeling the ladylike structure of my skirt and couldn't help but channel a more sophisticated vibe. Of course, I rarely wear an outfit without a load of accessories and my layered necklaces gave the outfit a more modern feel. If I took either of the necklaces away, the look changes ever so slightly. Also, pardon the schlumpiness of my shirt. It didn't feel as unkempt as it looks! But, it is a boyfriend shirt after all. I seriously love this whole outfit! The skirt is too cute, I need one! And the necklaces, perfect! This is so ladylike and beautiful! I love changing my style based on my mood, that's definitely what makes fashion so much fun!! I love that you mix up your styles! It's fun to be bohemian one day and the next look like Holly Golightly! You pull off all these styles so well! I love your skirt and shoes!! I'm the same way. And I like it like that! I think this is a great combo with the pretty white skirt! Such a wonderful outfit once, again! I absolutely love this white skirt. This is such a pretty outfit, you look amazing! Love how you've layered your necklaces!! Nancy, that outfit looks awesome on you! I love it! It's so Chanel with the draping mix of pearls! 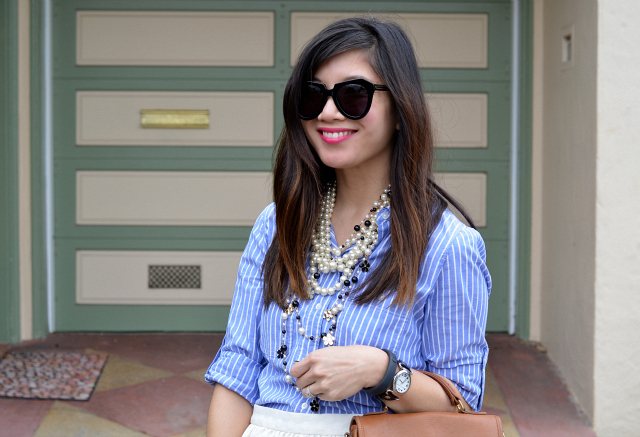 I love the skirt and stripey blouse. Simply fabulous. oooh, you know this blue and white combo is my favorite! Love it with the cognac bag too! Love all the necklaces with this outfit! Great styling...you definitely look very ladylike, yet modern. I love this look. The skirt is beautiful and perfect with that shirt and OMG YOUR SHOESSSSS are everythinggggggggggg! You are adorable! 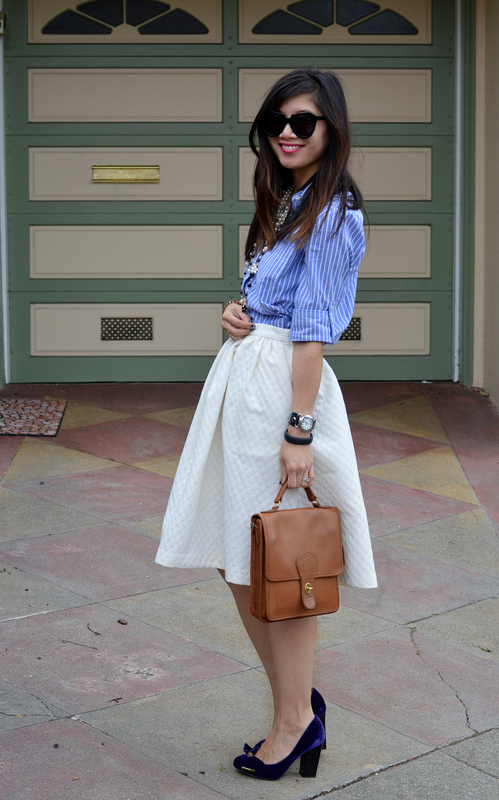 I love the look of the blouse with the tea-length skirt. Looks so refined and dainty. Beautiful styling! These photos of you are beyond amazing!!! I love this outfit, so chic! I always look forward to seeing what outfits you have - you always put a great spin on a simple outfit and make it your own! Aww choice bling! Very ladylike. love this ladylike outfit! you look so darling. those shoes are to die for! I love this striped shirt and skirt together. You look fabulous! You always accessorize so perfectly too. i love your take on modern femininity! that skirt is so great, and i love those shoes! I love your point of view! It is always so fresh and unexpected! I love the necklaces and the shoes are gorgeous! I love the skirt and this ladylike outfit! Well you look gorgeous! This skirt is so beyond wonderful!